Living room with ethnic influence and modern look. Bare space to cozy and colorful. This particular project was especially meaningful to me, and I am grateful that I was given the opportunity to create such a unique space. 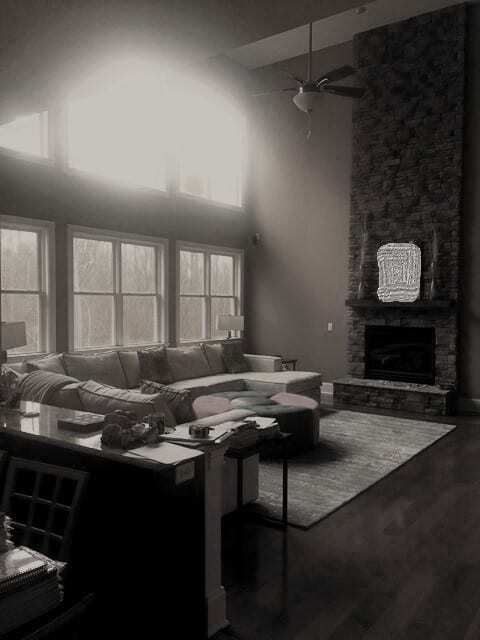 Moreover, I love that I was able to make this living room truly reflective of my clients’ personalities and histories. 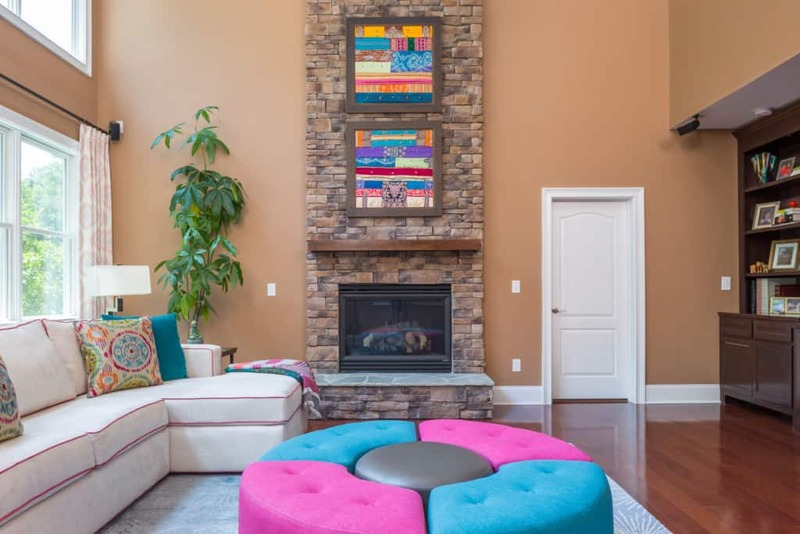 They originally reached out to discuss a few challenges with this living room. Their main concern being that the space did not feel cozy enough. I decided to make that my primary objective in re-designing this living room. The bare walls and windows create a colder aesthetic. The white ceiling creates a large, impersonal, open space. After assessing the current state of the living room and establishing a budget that the clients were comfortable with, my first suggestion was to create a coffered design for the ceiling. That would add some detail, created character, and also breaks up the otherwise blank space. Since the ceiling is so large, the sections of coffering bring some warmth and intimacy where there was only a feeling of sterile openness before. 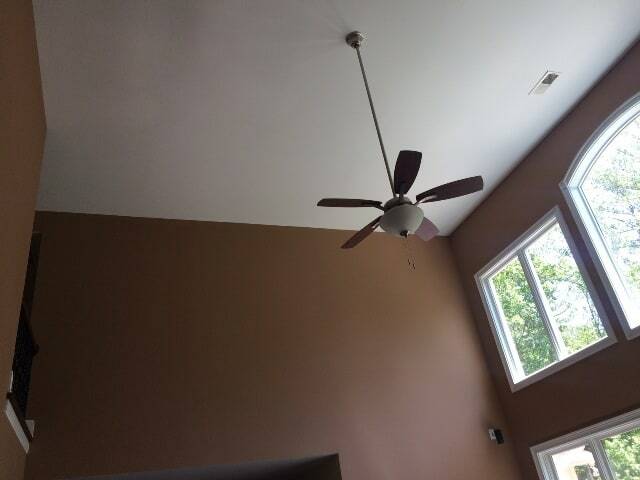 By painting the sections of ceiling a darker color, we were able to enhance this effect. 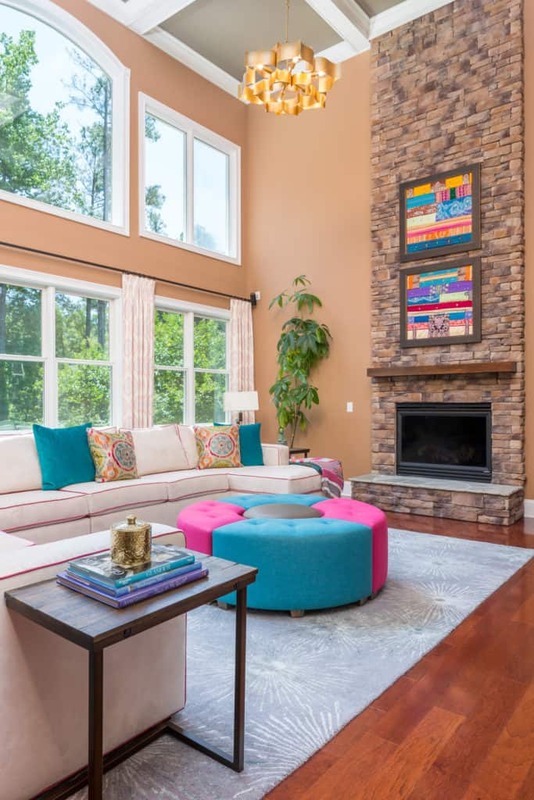 The wall of windows let in a lot of natural light, which was a great feature of the family room. However, it kept the space feeling slightly bare and cold. To warm it up I added neutral colored drapery. Adding the window treatments to the floor level windows, but not the not higher ones, keeps your eye on the lower part of the room. It also allows the upper windows to let in all the natural light you could want. Two story living room was transformed to a cozier space by adding a coffered ceiling with darker paint, installing four drapery panels only above the lower row of windows. Builder fan was replaced with a golden Lotus shaped chandelier and the custom made artwork features personal saris the family is not wearing anymore. Accenting the room was challenging, but enjoyable. Since my clients are of Indian heritage, they wanted to introduce elements that would bring out ethnic motifs to the décor, but also be subtle. We wanted fabrics and patterns that reflected traditional Indian décor, but could also be used in any other setting. To accomplish this, I chose a light background fabric for the textile that was designed with a paisley pattern in orange, teal, and fuchsia. And, since the ceiling fan was never actually used, I replaced it with a golden chandelier to add a touch of glamour to the overall look of the room and harken back to the Indian influence. Creating art work that tells a story. Now for the art. 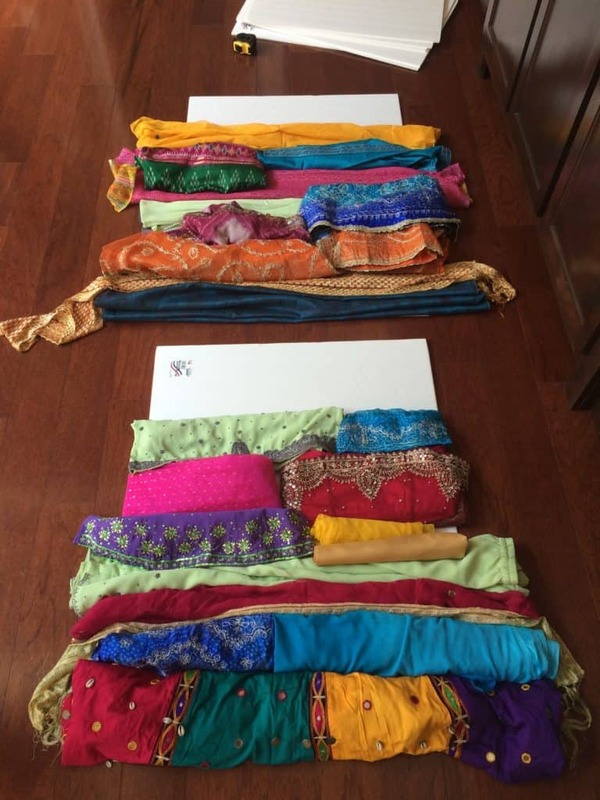 While brainstorming ideas on how to tie the room together, my clients and I had the idea of recycling old saris that the clients didn’t wear anymore. Of course, this was a challenge, but what a unique way to display the personality and heritage of the clients! The sheen, colors, and patterns were so different that it was a challenge putting together the combination and layout that fit the rest of the room. Initial layout for the artwork in this living room. However, once they were completed they brought together the entire room, and really became a focal point. I remember my client pointing to individual sections of the pieces saying “this is what I wore to that wedding, and that was the baby shower – and this is the one I had on at Diwali Festival.” Not only is it a unique piece that starts conversations, but it is a very personal addition to the family room that brings back happy memories for my clients whenever they look at it. This family room design was a joy for me to work on – it was challenging, fun, and most importantly, the final result meant something special to my clients. I enjoy being able to create a one-of-a-kind space that brings out the personality of whomever lives in it. I believe everyone should be comfortable and in love with their home – after all, you spend a large portion of your life in it! If you have a room that you’re not quite happy with, I’d love to help make it something exciting and meaningful for you and your family. Click here to contact me today, here if you would like to learn how our services work, here for full portfolio and here for other interesting blog posts.